Artificial Intelligence means automation, robotics and the use of sophisticated computer software and programs. Anyone who wants to make a career in AI should have specific education based on foundations of math, technology, logic, and engineering perspectives. AI professionals need to have good written and verbal communication skill as they convey how AI tools and services are effectively employed within industry settings. To acquire these skills, Artificial Intelligence Training programs are the best. According to the experts, four skills that are becoming much more valuable in AI are complex reasoning, creativity, social and emotional intelligence, and sensory perception. Experiential learning through hands-on apprenticeships and using technology to advance skills is required in new categories of jobs. Apart from these soft skills, here are the 5 most in-demand AI skills, as observed by Indeed. ML involves machines that are taught to learn and make decisions by examining large amounts of input data. It impacts the advancement of artificial intelligence by seamlessly blending artificial with true human intelligence to deliver the highest level of accuracy and understanding. Python is one of the most popular programming languages used by developers, and is also the best programming language for AI and neural network. The various prebuilt libraries in Python, like Numpy, Scipy, and Pybrain, make it a great choice for AI programming. No matter what the job profile is, knowing Python along with AI will make you stand out in an interview. One of the best examples of how the Data Science field is used in AI technologies is IBM Watson. It is an AI technology that helps physicians to access key information in a patient’s medical record to provide relevant evidence and explore treatment options. Data Science is an interdisciplinary field in AI that is used to extract knowledge or insights from data. The Java Virtual Machine Technology allows AI programmers to build a single app version that will run on all Java-enabled computing platforms. It is maintainable, portable, and transparent to program. WEKA Machine Learning Suite, Robocode, JOONE Neural Engine, and Polar mobile robots are some of the examples of developing AI using Java. 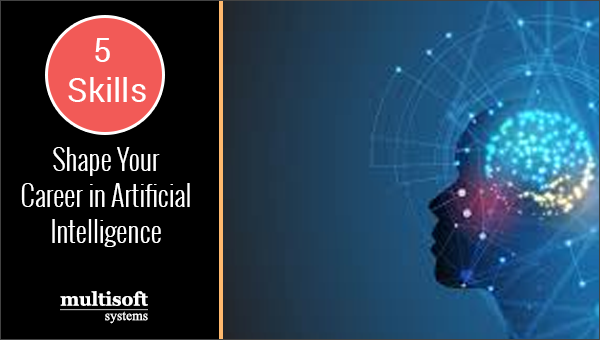 Multisoft Systems is an esteemed training organization which provides the best Artificial Intelligence Training in Noida. They induct only certified and industry-expert trainers to deliver the trainings. They are known for the great quality of their training programs, and dedication and commitment towards the learners’ future. They also provide customized courses for working professionals and candidates with special learning requests. Apart from the AI training programs, Multisoft also offers various programs that may come in handy while looking for a career in AI, like Big Data, SAS, R, etc. Get started today, if you want to see yourself working in this exciting and rapidly changing field soon.